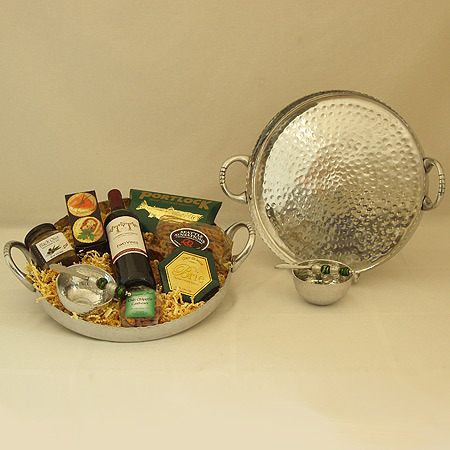 Impressive and perfect for entertaining, this beautiful 19-inch Hammered Stainless Steel Metal Tray and 5-inch Serving Bowl with Spreader Knife, all food safe, make a wonderful realtor gift, housewarming gift, wedding gift or a Northwest welcome gift for recruiting or relocation. Includes Columbia Crest Cabernet Wine, Portlock’s Smoked Salmon, Brie Cheese Spread, Olive Tepanade, Elki’s Crackers, Outrageous Offerings Chipotle Cashews and Seattle Sinsations Buttery Pretzels. Available with wine, champagne or sparkling cider. Our wine or champagne gift baskets can be delivered locally or shipped ONLY to Alaska, California, and Washington State. You must be 21 years of age to purchase this gift. The recipient must be 21 years of age and an adult signature is required upon delivery. This gift with sparkling cider can be delivered locally or shipped anywhere within the continental United States.